Yes, I know there are really good dumpling houses in the states. I also know of places with really good hot & sour soup (although not quite the same). How many places serve wontons in their hot & sour soup though? Seriously, if I've just been overlooking this classic combination, then shame on me, but the last time I asked a restaurant in NYC to combine the two, I was given the dirtiest of dirty looks (and though they ultimately did it, I think I was charged double for it). There's nothing strange about it at all, everyone loves dumplings! and most people I know love hot & sour soup. The sum of all parts will surely be greater than the individual components! And so it is. Located on 遼寧街, at a place called 阿宏小吃 or 'Ah Hong's Eatery,' there's a restaurant that's supposed to sell Taiwanese dishes. Evidently, to them, that basically means beef noodle soup, dumplings, and hot & sour soup. Their rendition of dumpling + soup combo is legit. 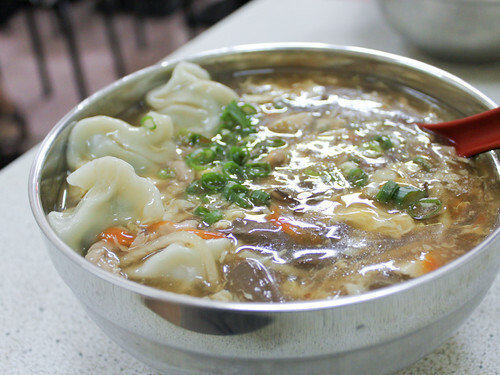 Thick skinned, chive dumplings made in house, are dumped directly into a bowl of hot & sour soup. The dumplings themselves are really nothing special, and actually, neither is the soup (which is the same as in America, plus the addition of pig's blood a.k.a. red tofu). Nope, what makes me love this combo so much, is actually the addition of flavors. If you poke holes in your dumplings, and allow the soup to seep into the skins, with every bite you get a blissful symphony of pork juices and hot & sour soup... in your mouth. It almost makes plain dumplings sound boring eh? I think the fact that I only paid 60 NT ($2) for 8 dumplings and soup made me that much happier. Yeah, I'm an idiot. I always order beef noodle soup. ALWAYS. For 85 NT ($2.50) I got this. Mmm, it's definitely not in my top 5 (actually, I don't have a top 5, but I'm pretty sure this wouldn't make it in if I did), but it's also not bad. My advice though? 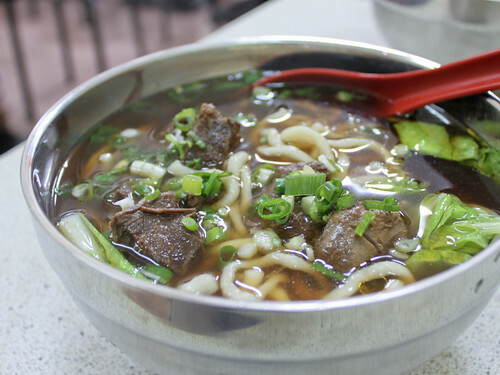 Skip the beef and just get the soup noodles. The broth is where it's at. While the beef is tough, and made from a rather cheap cut, you can literally smell the broth while walking past the outside of the shop. It's the kind of broth where the restaurant has probably stewed beef for several days continuously (which sounds like a DoH disaster), just to achieve the proper beefiness. Mm, the soup is definitely worth drinking. One thing that's charming/annoying (depending on your point of view)... there's a single person running the entire shop. Which means it'll take damn near 30 minutes for you to get your food. My opinion? Well worth the wait. Maybe the word 'wonton' is misleading, they're the same dumplings that are like... 8 for $3 at the soup noodle joints? Not the small thingers... so I can kind of understand the extra cost. I just didn't understand why it cost more for the 1 bowl than had I bought 8 dumplings, a bowl of soup, and poured it together. Does.not.make.sense.